In 2009 the U.S. Department of the Interior (DOI) established two partner-based entities to address challenges of climate change: Climate Science Centers (CSCs) and Landscape Conservation Cooperatives (LCCs). CSCs provide region-focused climate science to support management of natural and cultural resources. 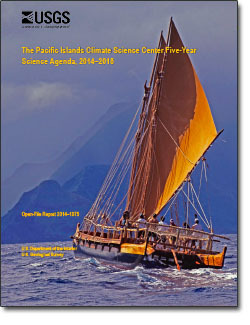 The Pacific Islands Climate Science Center (PICSC) was launched in 2012 and serves Hawaiʻi and the U.S.–Affiliated Pacific Islands region. The PICSC is hosted by a university consortium including the University of Hawaiʻi and the University of Guam. Partnership with academia provides scientific expertise along with commitment to capacity building in the region. In close partnership with the PICSC is the Pacific Islands Climate Change Cooperative (PICCC), which serves as the regional LCC. Together, they work with Federal, state, and other partners to deliver scientific research and interpretation. A biocultural framework emphasizes interconnected natural and anthropogenic systems and seeks to integrate multiple knowledge systems and modes of investigation. The vision for the PICSC is to inform and support sustainability and climate adaptation of human and ecological communities in the Pacific islands. Emphasis is on actionable science—science with a clear path for integration with resource stewards, with research organized around themes that guide progress of the PICSC. In this Agenda, four themes are identified as priorities, namely (1) Guidance for Anticipated Intermediate-Term Climate Changes; (2) Potential Effects of Changing Climate on Freshwater Resources; (3) Anticipating and Mitigating Change in Coastal and Low-Lying Areas; and (4) Forecasting Sustainability for Resource Management and Planning. Within each Theme in this agenda, objectives are identified that will advance knowledge and capabilities that were identified during the development process. Objectives may contain more than one science element. Some may be addressed with existing knowledge and research methods, while others may need to wait until essential information or tools are developed. Leveraging science and technology programs in other institutions based on shared or unique mission goals will help make effective investments. By virtue of the PICSC relationship with the host universities and the network of cooperators and stakeholders, the center facilitates educational training and capacity building. The Agenda is a living document and will revised to reflect both progress on existing objectives as well as development of additional or alternative science priorities based on evaluation of climate issues, knowledge, and capabilities in the region.